A dolphin weighing 600-pounds is rescued from a sandbar near Jones Beach and is recovering. Two weeks earlier, another dolphin was rescued from the Hudson River, but died. 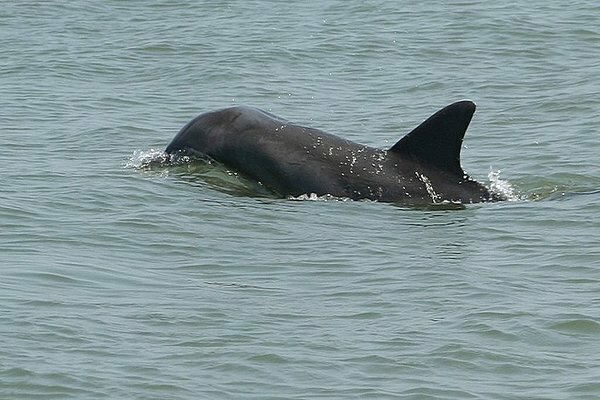 On Thursday, a 9-foot-long, 600-pound dolphin was spotted stranded on a sandbar south of Jones Beach. It was spotted by a boater. The Riverhead Foundation for Marine Research and Preservations arrived to the scene, along with the Coast Guard, to rescue the female dolphin. She was partially buried in sand and not moving. Rescuers unburied her and placed her on a stretcher for transportation to Oak Beach where she was loaded onto a truck and brought to the foundation’s hospital at the Long Island Aquarium and Exhibition Center in Riverhead. The rescued dolphin – a Risso dolphin – typically swims in deep water and exclusively eats squid, according to Kimberly Durham, the Riverhead Foundation’s rescue program director, in reporting from the Wall Street Journal. The dolphin was found dehydrated with gastric bleeding. The rescued dolphin has a long road ahead to recovery and a very expensive one given she’s underweight and requires a rich diet. The dolphin’s food intake will gradually increase until it is at the normal amount of 80 pounds of squid per day, which is roughly equivalent to $200. It can take about two months to reach a healthy weight for release, according to Ms. Durham. Donations are requested to help the dolphin recover. It’s fortunate that this rescued dolphin has a chance at recovery. Another female Risso dolphin rescued two weeks earlier – on Memorial Day – in the Hudson River did not survive. That dolphin likely starved to death as a result of four plastic bags blocking her stomach, according to an autopsy. Subject: LongIsland.com - Your Name sent you Article details of "Stranded Dolphin Rescued from Long Island Sandbar near Jones Beach"